Bears 2 faced a tough battle against a Blazers side who were unbeaten and top placed in their division at the start of the game. Taking a leaf from the Bears first game, the Bears came out with a high intensity defence putting pressure on the Blazers team forcing them into mistakes and only brief glimpses at the Bears basket. 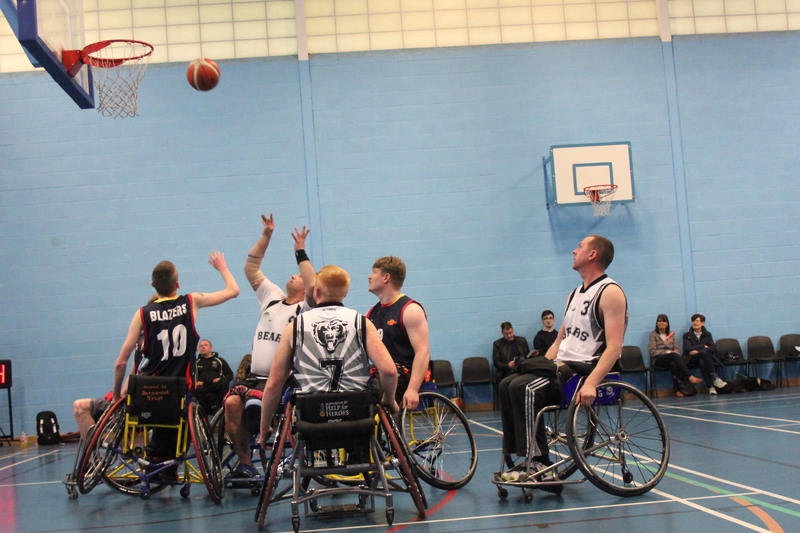 With the upper hand in defence, the Bears made the Blazers errors pay by scoring freely at the Blazers basket to go into the half time beak leading with a overwhelming lead of Bears 26 – 4 Blazers. The Blazers came out for the second half with a determination to try not lose their unbeaten record with a full court press. Although it slowed down the Bears attacking opportunities, the Bears continued with their impressive defensive game , seeing out the second half slightly opening the scores further between the teams and Bears taking the game 48 – 23. Quarter scorers: 1, Bears 2 12 Blazers 2; Bears 2 14 Blazers 2 ; Bears 2 8 Blazers 8 ; Bears 2 14 Blazers 11. Bears’ points scorers: Rick Powell 18 ; Neil Bunting 17; Dan Gill 11; Aimee Hillson 2.